Whos your segundo fav character? Whats the highest card you have? What's Your paborito Charater Design? Which first-year is your favorite? Help! I haven't seen the school idol movie yet and I could not make it to the theater because I live too far away. where can I watch it? 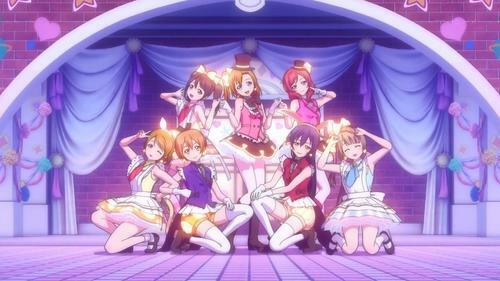 Where online can i watch pag-ibig Live School Idol Project Season 1 in English Dub or Sub? NICO NICO NIIIIIIIIIIIIIIIII~~~ PREPARE YOURSELVES! THE EVENT IS STARTING TOMORROW!!! Starting at 9:00am UTC, Friday 20th May and concluding 8:00am UTC, 30th May. The Nico Yazawa Medley Festival Round 5 is starting! Nico's always been one of the most liked girls, free gems are flowing around, 1000 + LP overflow bars and everyone seems to be playing with a sense of purpose after the update. "I'd say they're not ripe for the picking just yet." what? I thought as i separated and backed away from her "But don't abandon hope. They still have room to grow." W-wha- "What are you talking about?" "If you're too shy,you can lend them their support in secret"
yeah...i felt like slacking off yesterday: playing SIF,watching the final part of Cry and Cox play Resident Evil 6: Jake and sherry campaign (that ending was awesome...the middle of the campaign..eh...not so much...there was just full of "wtf?! "s there...),also a playthrough of Cry plays The Vanishing of Ethan Carter and Dreamfall,and pagbaba a book of mine...the may-akda is Pseudonymous Bosch (if i remember right...) well enough of my walang tiyak na layunin rant,lets get it on! yeah...its as you saw in the title,my other Maki centered fic will have to wait for a bit since it is Eri's Birthday today,i figured i should do something for the occasion...so i did what i am slightly good at,and that is to write stories,particularly a oneshot,since i realized that i am somewhat cut out for this than a series...if you know me long enough,you'd know that i have tried and failed at series types of stories...so yeah,enough of this,lets just start. Well, I started playing about two or three weeks ago. Admittedly, I only played it once throughout the first week, as my internet decided to be weird while the first proper download tried to install. Anyway, moving on. I decided to choose Eri-chan as my leader... It was pretty difficult to decided between her and Maki-chan, but I went with Eri-chan. I did also kind of want to choose Kotori-chan, but the other two were my main choices. But, I'm happy with my leader, so that's fine. a comment was made to the poll: paborito pag-ibig Live! School Idol Project Song? a comment was made to the pop quiz question: What character is the color gary of the group? a comment was made to the pop quiz question: What is Hanayo's favourite food? a comment was made to the pop quiz question: Who is the Best pag-ibig live? pagmamahal mabuhay! Eskwela idolo proyekto Pagtitip.